Background: Laparoscopic inguinal hernia repair continues to gain acceptance and has become the preferred approach for bilateral and some recurrent inguinal hernias. Further advances in technology and instrumentation have allowed surgeons to now perform these operations through a single incision. 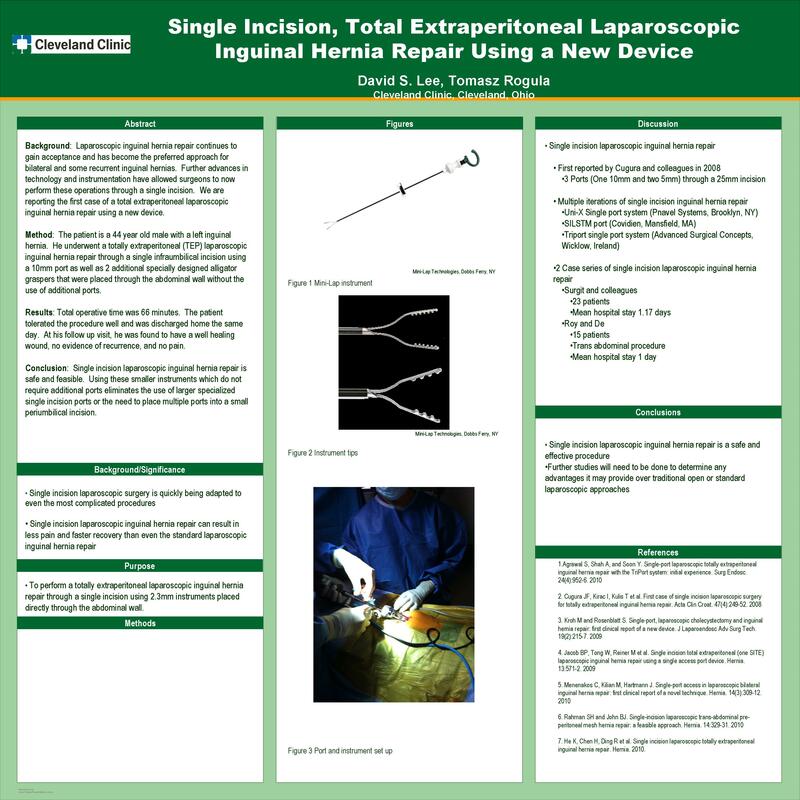 We are reporting the first case of a total extraperitoneal laparoscopic inguinal hernia repair using a new device. Method: The patient is a 44 year old male with a left inguinal hernia. He underwent a totally extraperitoneal (TEP) laparoscopic inguinal hernia repair through a single infraumbilical incision using a 10mm port as well as 2 additional specially designed alligator graspers that were placed through the abdominal wall without the use of additional ports. Results: Total operative time was 66 minutes. The patient tolerated the procedure well and was discharged home the same day. At his follow up visit, he was found to have a well healing wound, no evidence of recurrence, and no pain. Conclusion: Single incision laparoscopic inguinal hernia repair is safe and feasible. Using these smaller instruments which do not require additional ports eliminates the use of larger specialized single incision ports or the need to place multiple ports into a small periumbilical incision.